Open Fields has gained access to more than 90,000 acres of quality bird habitat, with an emphasis on pheasants, sharp-tailed grouse and Hungarian partridge. The 2018 hunting season marks the seventh year of a program by Montana Fish, Wildlife & Parks to open quality upland-bird habitat to public access while providing incentives for landowners to keep the land enrolled in the USDA’s Conservation Reserve Program. As part of the agency’s response to the precipitous decline in the state’s CRP enrollments for more than a decade, Open Fields has opened access to nearly 90,000 acres of bird hunting and experienced record enrollment this year. What’s more, every parcel enrolled in Open Fields is listed and mapped in access guides in both print and electronic formats. But, for context, the bad news: Changes to the federal Farm Bill and commodities prices have led to a serious loss of wildlife habitat in Montana that was formerly sustained through enrollment in CRP, which pays landowners to keep agriculturally marginal or erosion-prone acreage “grass side up” and out of production. CRP enrollments have decreased more in Montana than in any other state—down 60 percent from the peak and by nearly 2 million acres since 2007, leaving about 1.3 million acres in CRP. The impact of this loss has been clear. For example, Montana’s pheasant harvest has declined by about a third since the peak of CRP acreage and pheasant-hunter numbers by about a quarter. Open Fields is one tool in FWP’s Upland Game Bird Enhancement Program (UGBEP), designed to staunch the loss of habitat; other efforts include habitat enhancement and pheasant releases. Using a funding blend from the federal Natural Resources Conservation Service and fees on upland bird hunting licenses, Open Fields pays landowners a one-time lease fee of $5 per acre for each year that ground remains on the CRP contract. In exchange the Open Fields acreage is open to walk-in bird hunting with no permission required. Selection criteria focus enrollment on quality upland habitat—primarily for pheasants, sharp-tailed grouse and Hungarian partridge—with an emphasis on the state’s northern and eastern regions. Open Fields has several knock-on benefits built in. Habitat subsidized through CRP does not otherwise require public access. Landowners with adjoining non-CRP acres often offer bird hunters access to the additional land, which both improves their application to enroll in Open Fields and helps “square up” the parcels’ boundaries. Through this, Open Fields routinely has opened access to more than twice as many acres as the CRP portion of the parcel that is the basis for the financial incentive. According to Debbie Hohler, FWP’s UGBEP biologist, since Open Fields’ beginning, in 2012, more than 250 contracts have been entered into, opening nearly 90,000 acres to bird hunters. While some of those contracts have since expired, they average seven years. This year 55 new contracts represent a new high point for the program, while 2017 marked a new high for CRP acres enrolled. 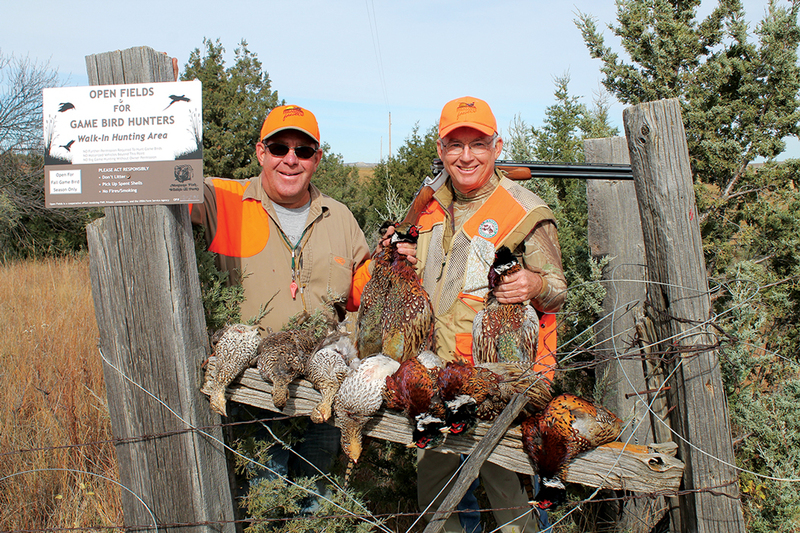 “Open Fields has opened the doors for upland gamebird programs,” Hohler said, as most of the landowners are working with FWP on bird habitat for the first time. Enrolled parcels can also create access points for adjoining public land or parcels managed for habitat through other UGBEP efforts. In addition to other habitat qualities, FWP field staff and biologists rank parcels for inclusion in Open Fields for exceptional upland opportunities. The UGBEP website also seeks feedback from hunters regarding their experiences on the ground. As for finding Open Fields parcels, the 2018 UGBEP Access Guide is available in print by request and as downloadable files from fwp.mt.gov/hunting/hunterAccess. The addition of georeferenced files for download means that all UGBEP projects can be added to a third-party platform, including Google Earth and OnX Hunt maps, on a phone or tablet. Choose from three once-in-a-lifetime opportunities to join celebrated magazine writers and fellow wingshooting aficionados on some of the best bird hunting trips on the planet. Sign up for more information about this year’s trips and we’ll keep you updated about space availability, new trip information, and Adventures news. What you need to measure a gun properly are the right tools. Enter the Shotgun Combo Gauge and the BoreMaster, from Robert Louis Company.